Pre-order in April for 20% off and free shipping! Beautiful, liveable, sustainable, restorative. Picture a world-class “community model of sustainability” that sets the highest standards for master planning, design and development, practice and operations. Picture a mountaintop community designed, engineered, and operated specifically to benefit all of its inhabitants for future generations. British Columbia’s UniverCity in Metro Vancouver was conceived in the 1990s as a series of solutions for a fast-growing academic institution located in one of the most desirable places to live in the world. Today, UniverCity is a thriving, full-service community of over 5,000 people—well on its way to a population of 10,000 residents. 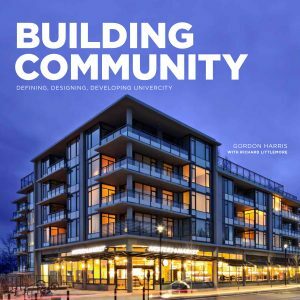 Capitalizing on a multitude of experiences and challenges, Building Community: Defining, Designing, Developing UniverCity presents a thoughtful collection of key insights and takeaways about how to make a very big impact—with a very small footprint. UniverCity’s journey from concept to an award-winning community is described in detail in Building Community. In an engaging and sometimes personal story of community building, this easy-to-read, comprehensively illustrated book vividly describes the context in which the UniverCity community has evolved. And, perhaps most importantly, this book is a process-based guide for creating a beautiful, functional, and affordable pedestrian-oriented community, designed for people of all ages—one that is replicable, resilient, and will certainly be as widely admired in 2120 as it is today.